Russia, China & Israel against Islamism? Two recent developments - Vladimir Putin's recent trip to the Middle East and the Chinese government's financing of an Israeli cargo railway - hint at a reshuffling of alliances in the region. The Middle East's most consequential divide is no longer the Arab/Israeli one but the Islamist/non-Islamist one, with Iran in one corner, Israel in the other, and other states somewhere between. It's far from a linear alignment, with plenty of incongruities; the revolutionary Islamists in Tehran and the evolutionary ones in Ankara, for example, increasingly are at odds, while the Tehran-Damascus axis flourishes as never before. The Russian and Chinese actions point to these alliances shaping the foreign policies of outside powers too. Whereas the European Union and the U.S. government are increasingly sympathetic to Islamism, in part as a way to tame their own Muslim populations, Moscow and Beijing have a history of open conflict with their Muslim populations and therefore adopt policies more hostile to Islamism in the Middle East. 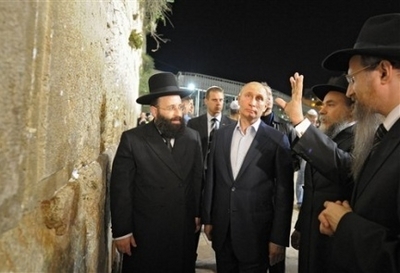 Vladimir Putin visited the Western Walls, wearing a kippa and accompanied by rabbis, at 2 a.m., where he read prayers and two Psalms. Which brings us to the president of the Russian Federation. Pinhas Inbari notes at "After Putin's visit: Are Israel and Russia inching closer together?" that his "decision to begin his tour in Israel, along with the large size of his delegation, indicated that Israel was the focus of the visit, while the PA and Jordan were of secondary importance." That's because, despite their major differences on Syria and Iran, the two governments "agree on another, no less relevant issue that dominates political discourse in the Middle East: the concern over the advent of the Muslim Brotherhood to power." One should not be deluded into thinking that Israel and Russia have become fast friends and strategic allies. Regretfully, Russia's best friends in the region are the rogue states of Iran and Syria. Yet, the shared concern regarding the advent of the Muslim Brotherhood and its welcoming by the United States, bring Russia and Israel a little closer. Today's Chinese deal fits the same template. Israel and China today signed historic cooperation agreements to build the Eilat railway and future projects, including the inland canal port north of Eilat. … The main project on the agenda is construction of a cargo rail line that will link Israel's Mediterranean ports in Ashdod and Haifa with the Eilat Port. There are also plans to extend the line to Jordan's Aqaba Port. … [Israeli sources indicate that the Chinese] consider the project to be important, as it fits in with China's global strategy to strengthen critical trade routes. … Tonight, the Israeli delegation will be guests at a special dinner given by the Chinese government. The food will be kosher lemehadrin.